We have a new saint! After decades of prayer by Serrans and other Catholics, our patron, Franciscan missionary Father Junípero Serra, was canonized by Pope Francis at a special Mass in Washington, DC, on Wednesday, Sept. 23, 2015. Serrans from across the U.S. and 10 other countries joined an estimated 24,000 faithful converging on the Basilica of the National Shrine of the Immaculate Conception for the first canonization Mass celebrated in the United States. It was the largest public event during the Pope’s wildly popular three-day visit to Washington. 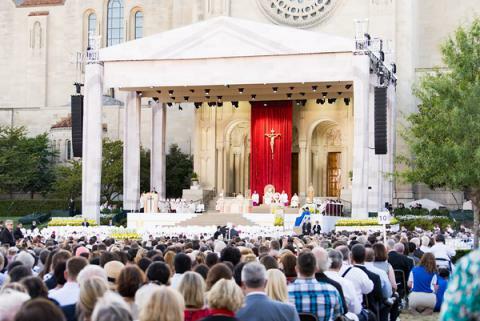 The Mass was celebrated outdoors on the east portico of the basilica, the largest Roman Catholic church in the United States and one of the 10 largest in the world. A large stage was constructed for the Mass, with seating and standing room areas for the assembly extending onto the grounds of the adjacent Catholic University of America. The D.C. area had showers Monday and earlier in the day Tuesday, the day before the Mass, but the clouds parted and the sun shone brightly by the time the Pope’s plane arrived at Joint Base Andrews Tuesday afternoon. The weather was picture perfect for all papal events Wednesday and Thursday, with showers again in the forecast the day after Pope Francis departed for New York. Serra International was not able to obtain Mass tickets for all Serrans who had indicated they planned to travel to Washington, but the leadership tried their best to accommodate as many as possible. In all, about 90 Serrans attended the Mass. Two buses hired by Serra International left the hotel shortly after 1:00 p.m. and dropped off the ticket holders by about 2:00 near one of the entrances for the Mass, which was scheduled to begin at 4:15. There was a crowd of several hundred people at the security station there, but everyone was upbeat with anticipation as they waited over two hours to pass through security screening. Once past that hurdle, there was more difficulty as the lengthy wait caused many of those who had tickets for one of the seated sections to wind up temporarily in the rear of a standing room section farther back from the altar. However, they were unexpectedly rewarded a few minutes later with a close up view when Pope Francis made his entrance to the grounds in the Popemobile and passed twice along a walkway separating the seating area from the standing room area. The view of the Mass was certainly better for those watching on TV than for most of those present in person, but all who were there found it a wonderfully spiritual and moving experience, truly a once-in-a-lifetime opportunity. Most of the multilingual Mass was in Spanish, but it mattered little for those who don’t speak the language. The beautifully done Mass program provided help with translations, and captioning on the large screens on either side of the altar assisted those who had a good line of sight to them. The extraordinary security measures had many areas around the basilica and CUA campus locked down until the Pope had departed the area, causing Serrans and their guests who attended the Mass to work up a big appetite walking seemingly endlessly for a couple of hours until they were finally able to meet up well after dark with the buses that would take them back to the hotel. Back at the Hyatt, 240 Serrans and guests attended a banquet to celebrate the canonization. The banquet had been planned to start at 7:00 but was delayed until about 9:00 to accommodate the Mass-goers. Though the hour was late when the banquet began, all were exuberant about the events of the day. View more fantastic photos of the event at these online galleries by Don Simoneaux and Greg Lynch, Jr.